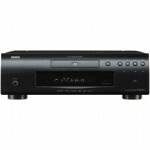 Amazon.com is throwing in a Denon Blu-ray player with the purchase of any qualifying Denon home theater receiver. The DVD-2500BTCI Blu-ray player is no lightweight either, literally. The 20lb player supports 1080p/24fps, 10-bit processing, 36-bit Deep Color, and Dolby TrueHD (7.1 channel) audio. The BD player normally sells for about $499 ($899 MSRP). Check out the list of Denon qualifying products at Amazon. Doesn’t matter if they are giving the players away, blue ray isn’t even worthy of using up an extra AV port!